If you like classic homemade hummus, you will love this roasted garlic hummus that’s kicked up a couple notches. Creamy. Sweet. Smoky. And just a touch spicy. Be sure to watch the quick video tutorial just above the recipe. Another day, another hummus dip, y’all! This time, cooked chickpeas—skins removed for a smoother dip—share the glory with two heads of garlic! If you have any Mediterranean blood in you, garlic probably doesn’t scare you. But if you just screamed, THAT’S LOTS OF GARLIC! Hear me out. 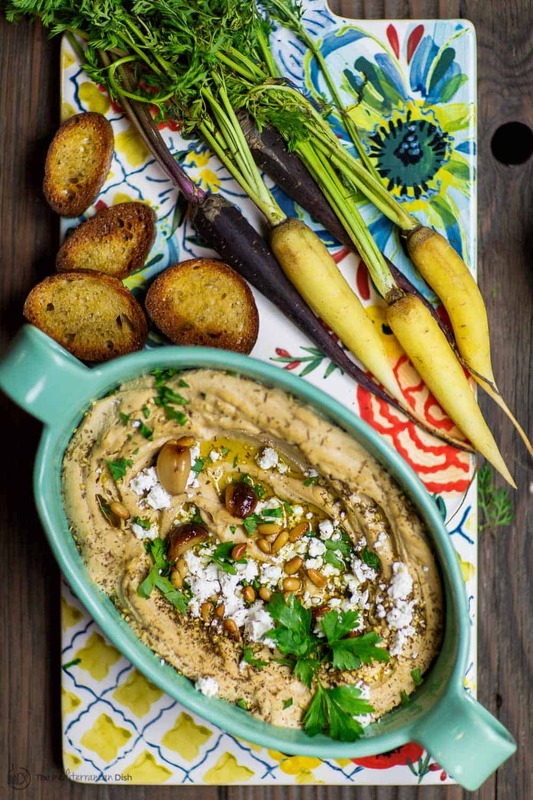 Why this Roasted Garlic Hummus Recipe works? Do not fear the garlic! Once roasted, garlic’s irritating pungency is replaced with a rich, sweet, and smoky flavor. And here, it lends it’s glorious flavor to the neutral-tasting chickpeas. Add in earthy tahini, and a little zing from sumac and za’atar…Heaven! Should you peel the skins off chickpeas? Now, removing the chickpea skins, as I do in this tutorial, may seem a little persnickety. 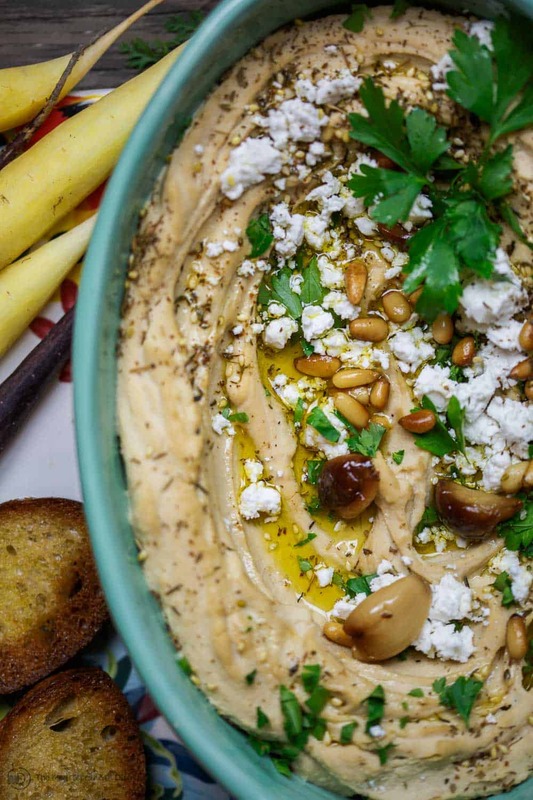 It’s the way to go if you want a silky-smooth roasted garlic hummus. Not feeling it? Be the daredevil who could care less and just leave the chickpea skins on (case in point, my roasted red pepper hummus.) You’ll have a rougher, more rustic dip. Delicious, still. One awesome tip that saves a ton of time, espeically if you love roasted garlic and plan to use it to jazz up salads, dips etc. Roast a bunch of garlic in advance and store it so it’s ready for use. Check out my post How to Roast Garlic and How to Store for all the details. 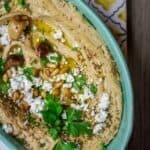 BEST Roasted Garlic Hummus dip! The perfect flavor combination in this silky-smooth, creamy dip. Sweet and smokey, with just enough zing. Top it with toasted pine nuts and feta for glorious party presentation! Remove the loose papery outside skin from the garlic heads, but keep the cloves intact. Cut about 1/2 inch from top. 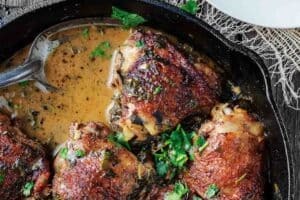 Place the garlic cloves each in a piece of foil that’s large enough to wrap around. Lightly drizzle with olive oil. Close the foil up. Bake in heated oven for 40 to 45 minutes or until the garlic is very soft. Remove from heat and let cool briefly, then peel. In the bowl of a food processor, fitted with a blade, place the roasted garlic, chickpeas, tahini, lemon juice, and water. Sprinkle salt, sumac and cayenne. Blend until smooth. Be sure to add a little more water as needed, until you achieve desired smooth texture. 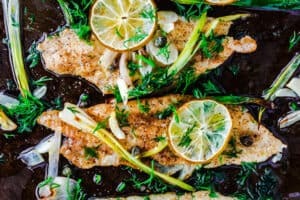 You can also add a little more lemon juice to your taste. Taste and adjust for salt and spices. 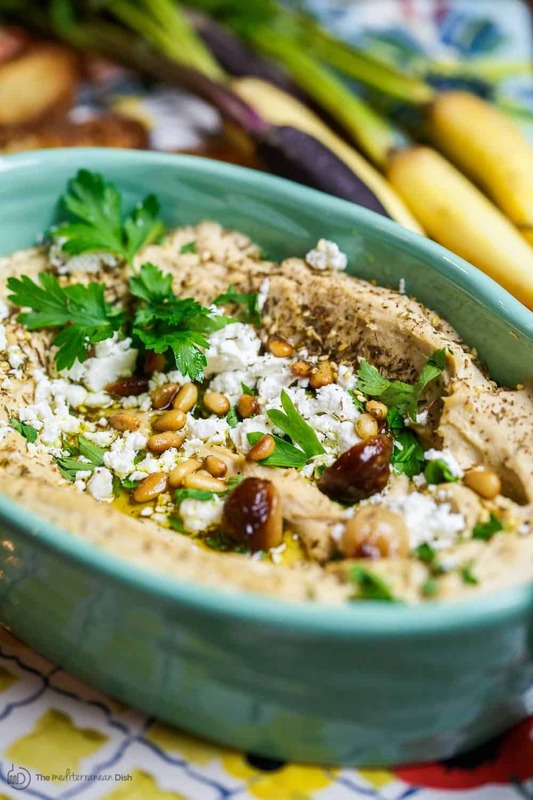 Spread the roasted garlic hummus in a bowl. Add a generous drizzle of quality extra virgin olive oil. 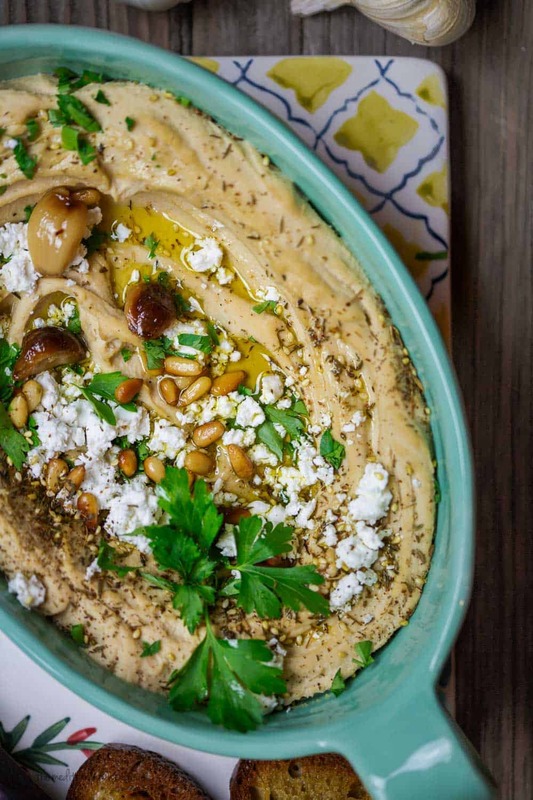 Top with za’atar spice, and if you like, parsley, toasted pine nuts, and crumbled feta. Serve with warm pita bread or toasted crostini and assorted vegetables. Enjoy! To roast a lot of garlic at once and store it for daily use, see this post for complete instructions. Recommended for this Recipe Our Private Reserve Greek extra virgin olive oil (from organically grown and processed koroneiki olives). And from our all-natural spice collection ground sumac and za’atar spice blend. SAVE!! 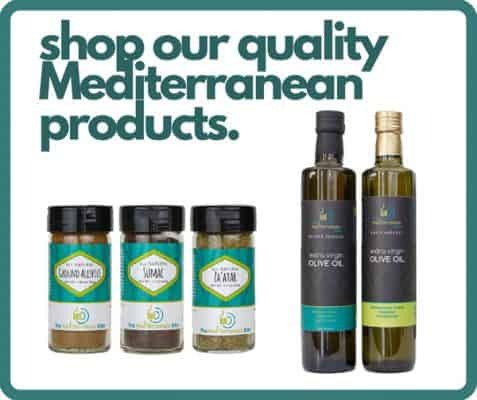 Try our Ultimate Mediterranean Spice Bundle! Or create your own 6-pack from our all-natural and organic spice collections! If I make this, how long will it keep in the fridge? Thank you for shearing the recipe. Hi Pat! So so sorry I just saw your question…I’m not always able to get to comments immediately. 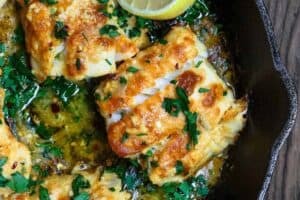 Because of the citrus and roasted garlic in this, ideally you would make it the day you serve it…a few hours earlier if you like. One evening before is fine as well, and keep in tight lid container in fridge (don’t garnish until ready to serve). I am always cofused when people just call for tahini. Do they mean tahini paste or the tahini sace?? Thank you so much for getting back to me. I really enjoy your recipies! I made my dried chickpeas in my Instant Pot while the garlic cooked. Then I followed the recipe to the letter. It is amazing! I make a lot of hummus from scratch. 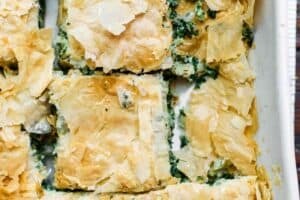 I love this one with the roasted garlic and feta. Thank you! Maureen, that’s brilliant! Thanks so much for sharing! I have yet to buy an Instant Pot. Seems like a good use for it! Never knew how easy it is to make it! I am definitely going to make my own hummus! But removing the chick pea skin sounds pretty tricky… What is the easiest way to remove the skin?? I can’t believe I never make my own hummus! I love the idea of extra garlic bc I can’t get enough. Who needs cheese dip for the super bowl? I want hummus! Lol! Garlic for the win! Ok, you definitely need to be my neighbor. If you have hummus, I will always bring the wine! This looks incredible! I could snack on this all day long! I love the garlic flavors! 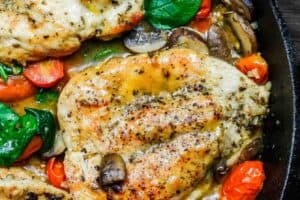 This looks heavenly, I can smell all that roasted garlic now!